OPoker is owned by MPP Entertainment Limited and is licensed by the Lotteries and Gaming Authority of Malta, which has been a member of the EU since 2004. OPoker does not accept customers from the US, People’s Republic of China, Hong Kong, Turkey, Macau or Vietnam. The software is available in a downloadable and instant play version making it accessible to more people around the world. They offer multiple bonuses and promotions to new players and existing players and they have plenty of tournaments to choose from every month with exciting prizes up for grabs. OPoker is powered by Boss Media, the online gambling software provider. The software is available in a downloadable version and a no-download instant play version. Players can choose from a variety of popular online poker games including Texas Hold’em, Omaha and Omaha hi-lo. The OPoker software provides basic information on the rules of the games and hand rankings for their players who may be new to the game of online poker. 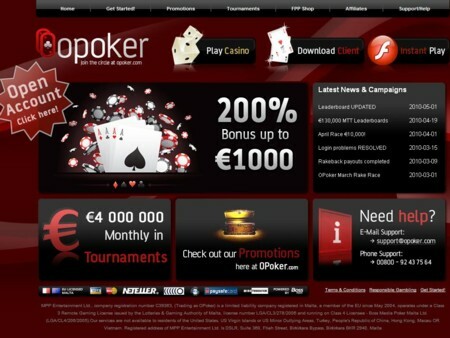 OPoker offers regular tournaments with a guaranteed €4,000,000 in prize money available every month. They offer sit and go tournaments, freerolls, guaranteed prize pool tournaments and satellite tournaments on a regular basis. 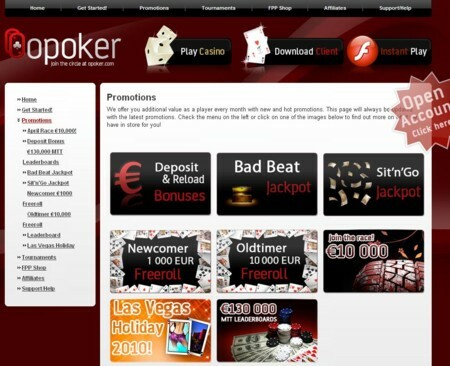 OPoker offers numerous bonuses to their new and existing players. New players at OPoker will be eligible for a 200% deposit bonus up to €1,000 on their first deposit. There is also a €1,000 new player freeroll that all new players are eligible to enter. OPoker is running a promotion that is offering a €10,000 package for travel, accommodation and spending money to the WSOP 2010, to the winner. Players who have played at least 1,500 raked hands over the last month are eligible to enter the €10,000 old timer loyalty freeroll. OPoker is running an exciting €130,000 MTT Leaderboard promotion. For 6 months, from January 2010 to the end of June 2010 they will be awarding a total of €20,000 per month in cash prizes to the top 100 players. At the end of the 6 months, in July 2010 the top 5 players from each month will compete for a €10,000 package. They offer a bad beat jackpot, a sit and go jackpot and more. Players are able to accumulate FPP (frequent player points) simply by placing bets. OPoker’s premium FPP shop is opening soon where players will be able to use their FPP to redeem computers, gadgets, travel, live poker events, concerts and more. If you have any questions when playing at OPoker you can contact their customer support team 24 hours a day, seven days a week. They can be contacted via telephone or email through their web form. They also offer a frequently asked questions section where you may be able to find the answer to some of your general questions. Players can make deposits into their OPoker account via a number of convenient methods. These include VISA, Master Card, NETeller, Moneybookers, Click2Pay, Paysafe Card and wire transfer.